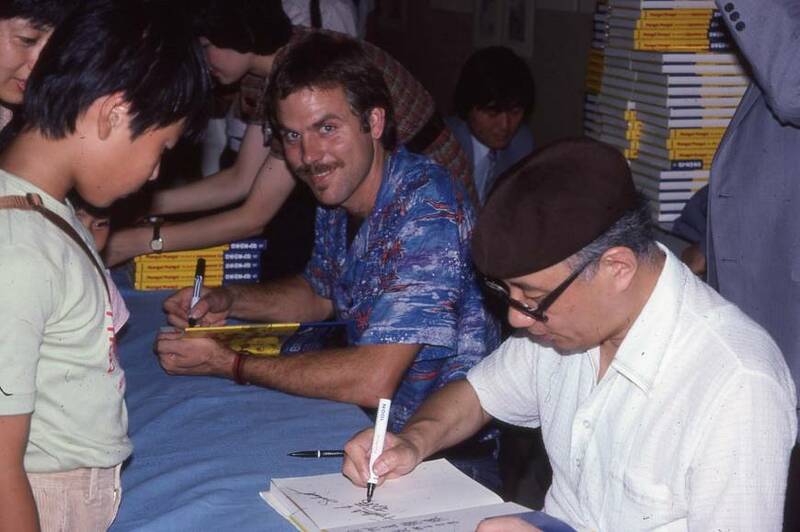 In 1977, American author and translator Frederik L. Schodt and three friends formed a manga-translation group in Tokyo, with the then-quixotic dream of introducing Japanese comics to a global readership. Schodt had arrived in Japan in 1965, courtesy of a father in the United States Foreign Service. He returned in 1970 to attend university after a short stint in the U.S. At the time, manga were everywhere in Japan, he says, and a lot more fun to read than textbooks. Schodt became addicted to the gag-and-parody series published in boys’ magazines. But one day a friend loaned him a copy of Osamu Tezuka’s epic 12-volume “Phoenix” — and he was stunned. “It made me realize that the work of Japanese manga artists was sometimes approaching the best in literature and film,” he says. So he and his translation team went straight to Tezuka Productions to get permission for their debut project. To their surprise, the artist, already a celebrity in Japan, known as “the god of manga” for hit titles such as “Astro Boy” and “Black Jack,” greeted them personally and said yes. The five volumes the group translated by 1978 — without the aid of computers or photocopiers — found no American publisher and gathered dust in Tezuka’s Takadanobaba offices for nearly a quarter century until Viz Media began releasing them in 2002. 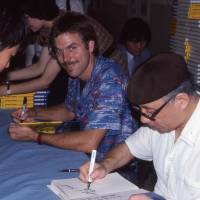 Now you can find Schodt’s illustrated likeness standing beside Tezuka’s in a panel from “The Osamu Tezuka Story: A Life in Manga and Anime,” a 900-plus page graphic biography that will be published in English for the first time next month. After appearing in serial form in Asahi Graph, the original Japanese paperback edition of the biography was published in 1992 as “Osamu Tezuka Monogatari,” three years after Tezuka’s death at the age of 60. It was illustrated and authored by Tezuka’s assistant, Toshio Ban, who quotes liberally from Tezuka’s own art and prose, including his autobiography, “Boku wa Mangaka” (“I am a Manga Artist”). The format of the English translation is based on the large-sized paperback of the Japanese original. The translation itself is, of course, by Schodt. Readers may recognize Ban’s name from the 2012 manga essay, “I am a Digital Cat,” a collaboration with Tokyo-based British novelist and nonfiction author, Peter Tasker, depicting a dystopian future Japan ruled by robotic cats. Advance copies of the English version of Tezuka’s biography, published by Stone Bridge Press, contain only excerpted segments, but it’s clear that Ban is skilled at mimicking his master, evoking his circular designs and shifting, cinematic perspectives. 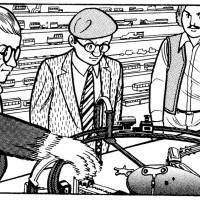 The story is linear, a chronological narrative of the experiences that shaped Tezuka. A grade school teacher encourages him to keep drawing at an early age. As he struggles to balance art with his medical studies (his father was a doctor), his mother advises him to “choose the path you love.” And as Japan recovers from the war, Tezuka goes to the movies, vowing as a young man to attend the cinema 365 days a year. For Schodt, translating the biography revealed even more about a man he describes as deeply complex, ambitious, competitive, and relentless in his pursuit of knowledge. Tezuka’s own life struggle ended far sooner than most expected, and Schodt notes that the biography debunks myths about his public persona. Despite being authorized by Tezuka Productions and produced by his former assistant, “The Osamu Tezuka Story” is no hagiography. Yet the diligence has arguably paid off. Tezuka is much better known outside of Japan than he was when he died in 1989, and while he never saw his work published in English during his lifetime, today there are several translations of Tezuka available, more than of any other manga artist. And that’s partly because he created more. Roland Kelts is the author of “Japanamerica: How Japanese Pop Culture has Invaded the U.S.” He is a visiting scholar at Keio University in Tokyo.